Grass jelly. This dessert is made from boiling stalks of certain vegetables with starch. After it cools, it forms a jelly-like consistency that is typically cut into small cubes and is normally black in color. Rice noodles. This is a very common dish in Thailand and can be eaten with almost anything. Dragon fruit. Think white kiwi. It is typically served already skinned of its hot pink casing. It has a subtle sweet taste, but not any of the tartness that a kiwi or citrus fruit will have. Whiskey. Phitsanulok is known for its own brand of whiskey that is exported all over the country. Not a fan of whiskey? Keep some around for sore throat, and one shot will cure it! How monks get their breakfast. Since Buddhist monks depend on charity, observe the interesting way in which they get their meals: The monks will stand in a line outside of a store, patiently waiting. The owner of the store will come out, remove his shoes, and bow to the monks before offering them something to eat. Vegetable throwing. Some restaurants on the street have a tradition of throwing greens in the air. One member of your party will be donned with a ridiculous looking apron and hat and led to stand on a rolling staircase. The staff play instruments and sing loudly on the street, and then the just-cooked food will be tossed into the air, hopefully to be caught in a large frying pan by the person on the stairs. Of course, this is much funnier after consuming the above-mentioned whiskey. 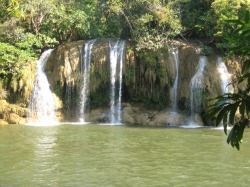 Visit Saiyoke Yai Waterfall and National Park. Cross the river on a rope bridge and trek your way through the jungle to see the waterfall. Keep an eye out for some wildlife you’ll never see in the States.